Oil can be seen floating in the test area. A2Z was contracted by Southern Maryland Oil to clean up a spill of 319 gallons of home heating oil in the basement of a home in Upper Marlboro, Maryland. The bulk of the oil had already been pumped out of the basement. An A2Z Environ-mental crew arrived to clean up the remaining oil. 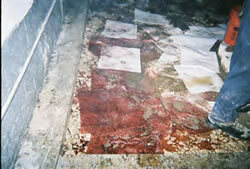 Oil-dry was worked into the con-crete floor to remove the oil from the surface and the cracks and crevices. Be-cause of the odor, the home had to be ventilated. Two carpet dryers were brought in to ventilate the house. Using a PID (photo ionization detector) it was determined that oil had worked it‟s way under the concrete. 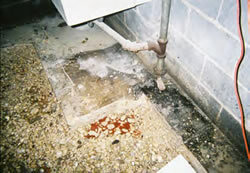 During the night there was a rain storm and the sump pump failed, resulting in a flooded basement with oil floating on the top. A vacuum truck was brought in to re-claim the 2,976 gallons of oily water. The product was taken to a local oil recycler for disposal. The floor was cleaned with detergent and hot water. The PID still showed the presence of oil. A five man crew was brought in to drill 30 pilot holes to check under the concrete for oil. The PID measures TPH (total petroleum hydrocarbons) in parts per million. Every hole was "hot", meaning the reading was above 75 ppm per hole. A concrete saw and jack hammer were used to cut out six 3‟x3‟ squares, as test holes, to get a visual under the concrete. Two air movers were used to remove the dust. There was free oil in each area. It was determined that the complete floor and the con-taminated soil below had to be removed. The concrete floor was broken up with jackhammers and the debris was carried out in buckets to be loaded into roll-off containers. It took three containers to complete the concrete removal. The concrete was taken to a local recycler for disposal. Below the floor was a layer of pea gravel. The pea gravel was saturated in oil; there was no way to reclaim it. The gravel and soil were removed by hand digging and using a wet/dry Vactor truck to vacuum the debris. It was then loaded into 20 yd containers that were lined with a poly liner. The soil was later taken to a local soil reclamation fa-cility for recycling. It took three weeks of digging to get the oil level below Maryland Department of Environment‟s limits. A total of 131 tons (11 loads) of contaminated soil were removed and recycled. Another test area comes up hot. The walls in the basement were oil-soaked from the spill. To remove the oil, a heat gun was used to heat the area in order to draw the oil out so the walls could be scrubbed with a strong detergent and hot water. This was repeated several times. When the oil was completely removed and the walls washed clean, a coat of masonry paint was applied to seal the interior walls of the basement. Ninety-nine cubic yards of Flo-Ash were installed to replace the soil and gravel that were removed.